3rd May. £15 for F&I Members and £20 non-members. Meet on the course on the day - time depending on the start list. Make sure you give Ann your contact details. 20th May. £50 for riding places - F&I members only. £20 F&I members to spectate and £25 non-members spectate The day will focus on training the horses and riders, with discussions on training issues and on coaching techniques, as well as what a dressage judge would be looking for. 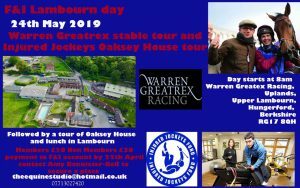 Tour of Cheltenham winning trainer Warren Greatrex's racing yard in Lambourn followed by a tour of the Injured Jockeys Oaksey House rehabilitation facility, concluding with a late lunch in Lambourn. £20 members £30 non members Please send payment to Debbie via F&I account before 25th April to secure a space. 6th Sept. £15 for F&I Members and £20 non-members. Meet on the course on the day - time depending on the start list. Make sure you give Ann your contact details.